The advent of digital technology has not only changed methods of communication and information management, but also the visual and postural-motor habits of users. To respond these emerging needs, the ophthalmic industry has taken the path of innovation in the area of physical chemistry and optical design. This article presents a twofold technological breakthrough, which gave rise to a new category of ophthalmic lenses for a connected life. Designed by Essilor, a world leader in ophthalmic optics, these lenses are dedicated to users of all types of digital devices. The last ten years were marked by the emergence of digital devices, such as smartphones and tablets. Already indispensable to our daily lives, they are revolutionizing the way we communicate, learn, stay informed, work, entertain ourselves and relax. With an average of four different devices (computer, smartphone, tablet and TV), we tend to switch between them more frequently and at times even use them simultaneously (Fig. 1). The time spent using these devices has increased significantly and continues to grow: indeed, nine out of ten people state that they spend more time using them today than they did two years ago. Our daily lives have been turned upside down by this digital revolution, but everything has also changed for our eyes. Indeed, the use of these devices creates new visual and postural behaviours and modifies our light environment. Ten years ago, there was only one reading distance: the distance at which we held a book or newspaper. On paper, characters have always been fixed in size and highly contrasted. Today, in addition to reading books, we also read on smartphones, tablets and computers at different distances (some of them quite short) and in various postures, as a study undertaken by the Essilor R&D has shown. On screens, characters are becoming smaller and more pixelated. Furthermore, our light environment has changed. Ten years ago, our eyes were exposed to natural light or artificial light emitted by incandescent lamps. Now, our eyes are constantly exposed to the bright light of screens and other light sources, such as LED or CFL bulbs, which strongly emit of diffusing and potentially harmful blue-violet light. Over one out of two people are bothered by the strong brightness of their screens. Lastly, the harmful blue-violet light emitted by screens can contribute to premature aging of the eyes. This study showed that all users of digital devices – regardless of their age, the type of device used and the frequency of use, feel the same discomfort, related to the difficulty of reading small characters and screen brightness. However, the level of discomfort varies depending on the user’s age. In fact, for younger users, the main discomfort is screen brightness, while for older users, it is the effort required to decipher the small characters. Mid-distance lenses combined with Crizal® Prevencia® coating, for presbyopes (aged 45 and over), specifically designed for digital devices use. Eyezen™ lenses are meant to replace standard single-vision lenses for wear by ametropic patients, but are also intended for occasional wear by emmetropes during their on-screen activities. In addition to providing perfect correction for ametropia, Eyezen™ lenses also provide the necessary accommodative support to relieve eyes from stress while using digital devices, which differs depending on age. On top of that, they protect eyes from the harmful light emitted by screens, reduce glare and improve contrast thanks to their Crizal® Prevencia® coating. Lastly, the mid-distance lenses are intended for occasional wear by presbyopes during their on-screen activities or during any other activity requiring near or intermediate vision correction. Near mid-distance lenses are optimized for smartphone or tablet use with wide near vision fields, but they also provide an intermediate vision field suitable for computer use. The minimum guaranteed depth of field is 80 cm, regardless of the prescription. Mid mid-distance lenses are optimized for computer use with wide intermediate vision fields, while also providing a near vision field suitable for smartphone or tablet use. The minimum guaranteed depth of field is 100 cm, regardless of the prescription. Finally, Room mid-distance lenses are optimized for large screens use with wider extended vision fields (delimited by room size) and offer intermediate vision and near vision fields suitable for computer, smartphone or tablet use respectively. The minimum guaranteed depth of field is 220 cm, regardless of the prescription. 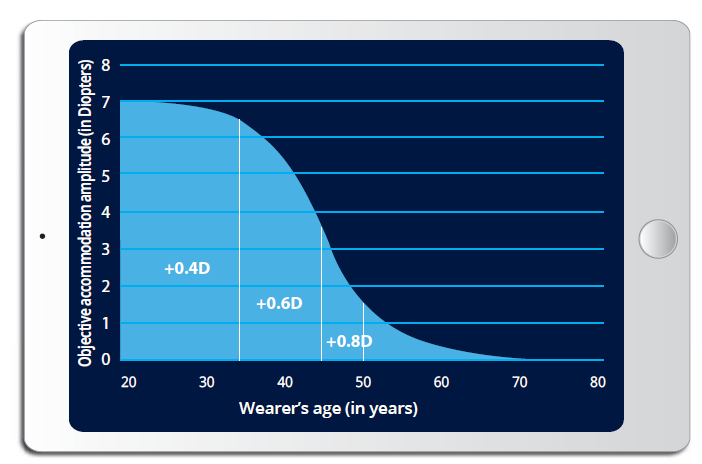 To respond to the emerging needs of wearers, Essilor brings its expertise in two areas: first, in optical lens design, to provide a perfectly suited correction, and secondly, in the area of protective lens coatings, to protect the eyes against the potential dangers of the blue-violet light emitted by screens. The range originated with a twofold technological breakthrough. 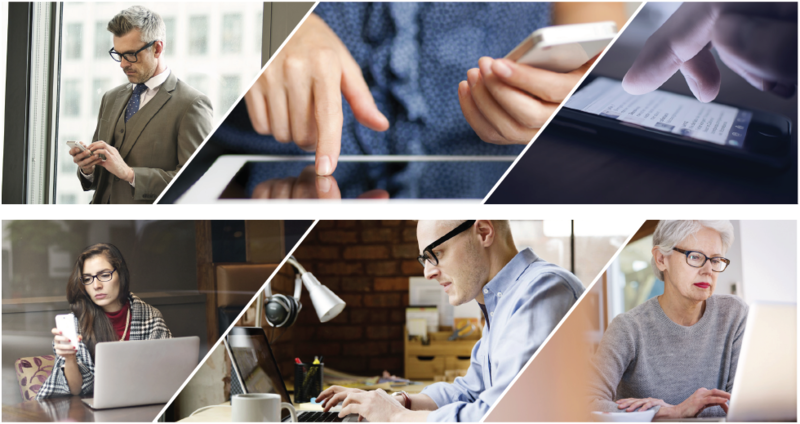 Essilor R&D conducted a study on the emerging visual and postural behaviors engendered by the use of digital devices. The study revealed that the average reading distance is shorter on these devices than when reading on traditional paper media (33 cm for smartphones and 39 cm for tablets versus 40 cm for paper). 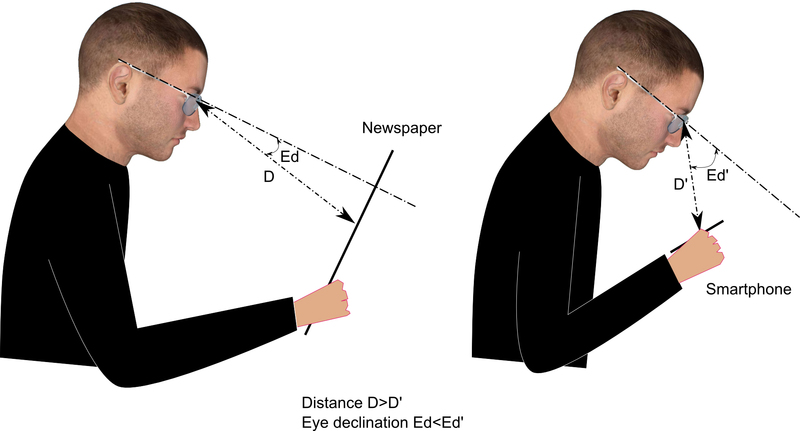 Researchers also noted an average increase in the eye declination angle while reading on a smartphone (25° for smartphones versus 18° for a reading task on paper). These data (Fig. 4) reveal the need for a new Ultra-Near Vision field. A unique power distribution technology was designed to respond to emerging needs. This technology distributes the power over the lens, including additional power in the bottom part of the lens to support the eye’s accommodation effort when using digital devices, according to the physiological needs of each identified group of wearers. It is important to point out that this additional power respects the physiological functioning of the visual system, without inhibiting the accommodative function of the wearer’s eyes. How is this technology managed on Eyezen™ lenses? The additional power values selected are related both to the fact that the objective amplitude of accommodation decreases with age  (Fig. 5), and that accommodative power drops after sustained and prolonged near-vision work . For example, a drop in accommodative power of 0.4D was observed after 20 minutes of near-vision work for a traditional reading task . For this reason, the additional refractive power provided is 0.4D for the 20-34 age group, 0.6D for the 35-44 age group, and 0.85D for the 45-50 age group. How is this technology implemented on mid-distance lenses Varilux® Digitime™ for presbyopes? Most near-vision exams are performed at a distance of 40 cm for reading tasks. This data is taken into account in the design of the new ophthalmic lenses for presbyopes connected life, so that wearers can effortlessly find their near-vision zone while reading. However, when using their smartphone, they bring it closer and naturally lower their gaze. At that point, their eyes encounter the additional power under the nearvision zone, thus relieving accommodative excess. This technology creates an additional field of vision: the Ultra-Near Vision zone, which provides additional power. This zone, located under the near-vision zone, allows users to lower than gaze more than when they are reading on paper media. This additional power allows users to use their device at closer distances. The additional power provided by the lens reflects users’ specific characteristics, as well as their prescriptions and the widths of the fields of view of the target product. So the additional power will not exceed 0.5D depending on the chosen lens and prescription. Finally, the near-vision zone is not impacted by the additional power. The eye health practitioner’s prescription is therefore always respected. Since using a smartphone at a distance of less than 40 cm (Fig. 6) is likely to generate a substantial degree of discomfort and difficulty in focusing (i.e. blurred vision), the additional power under the near-vision zone provides support for accommodative effort, giving the wearer’s vision more clarity. Fig. 6: Benefits of the Ultra-Near Vision zone provided by additional power. Smartphone use without additional power (above). With additional power (below). What are the benefits of this technology for the wearer? The additional power helps to reduce visual fatigue for the wearer, even during prolonged smartphone use. It also improves the readability of small characters. Finally, it allows presbyopes to adopt a more natural posture when using their smartphone. Positioning of visual zones on mid-distance lenses. The ultra-near, near, intermediate and extended visual zones are positioned optimally – in view of design constraints (width of the fields of view, prescription, minimal guaranteed depth of field, etc.) natural gaze lowering of the wearer and average use distances for each specific digital device (Fig.6). With the exception of the ultra-near vision zone, which includes a progressive zone followed by an area of stable power, all zones are stable in power, thus improving comfort for the wearer. The positioning of these zones is customized to the prescription to follow the wearer’s natural convergence and provide good binocular vision. In this regard, the zones are properly positioned in the lens, vertically and horizontally, to minimize visual fatigue for the wearer. Characteristics of the intermediate vision zone. 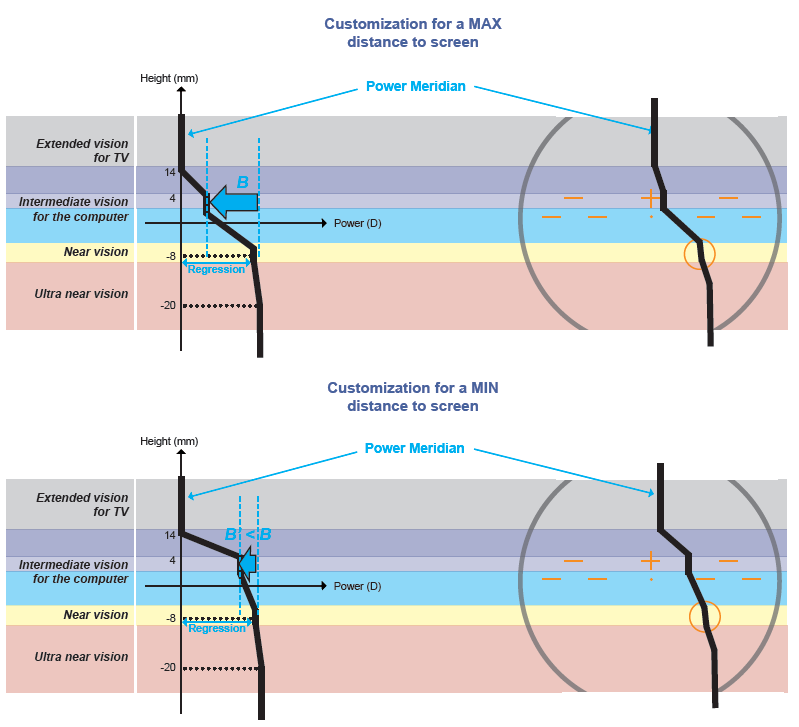 Between the near vision zone and the intermediate vision zone, or extended vision zone depending on the case, there is a variation in power known as degression (Fig. 7). This helps to ensure a given minimum depth of field (Fig. 3). The value of this degression is set according to the prescribed addition value, the desired minimum guaranteed depth of field and the wearer’s subjective accommodation. The average distance of use for a computer is 63 cm, but a wide variation has been observed: 95% of people use a computer at distances between 38 and 88 cm. It is therefore recommended to customize intermediate vision for each individual. To customize intermediate vision, Essilor has taken into account a new parameter known as “Screen Distance”, which corresponds to the distance between the eye and the computer screen. When calculating the lens, this parameter is used to customize the degression and the horizontal positioning of the intermediate vision zone relatively to the near vision zone. Taking the “Screen Distance” into account does not change the vertical position of the intermediate vision zone in the lens. The length of the degression is therefore fixed. A general illustration of customized degression as a function of “Screen Distance” is given in Fig. 8 for Room mid-distance lenses. Fig. 8: Principle of degression of the intermediate vision field customized relatively to the “Screen Distance” parameter for Room mid-distance lenses and a given fixed degression. 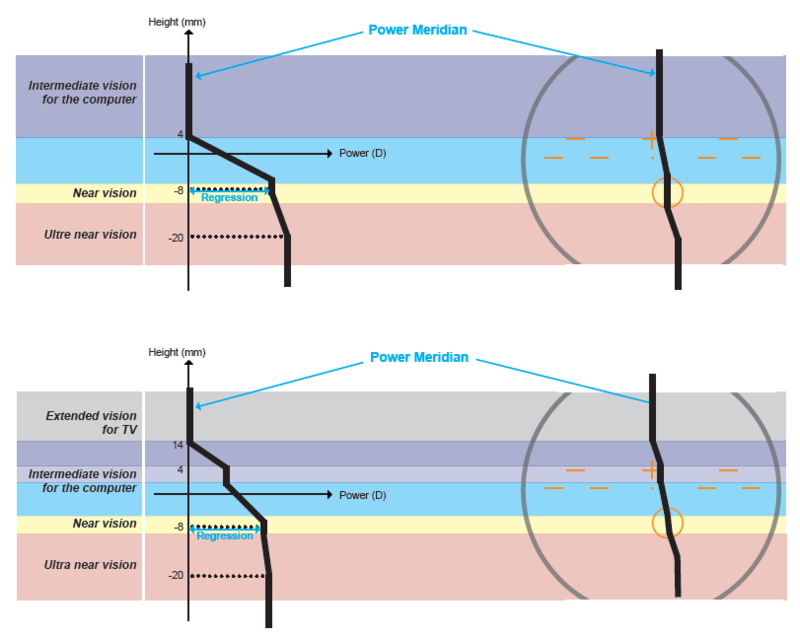 The left-hand image represents the power variation along the meridian sectional view, and the right-hand image the location of the meridian on the lens seen from the front. For the same prescription and two different ”Screen Distance”, the lateral position of the near vision zone remains unchanged, but the lateral position of the intermediate vision zone for the computer is customized. The default “Screen Distance” value is set to 63 cm which is the average distance of use for a computer (in the event that the optician do not indicate this parameter when the order is placed). It may range between 35 and 99 cm (as a reminder, 95% of people use their computer at a distance ranging between 38 and 88 cm). The benefits provided by this parameter are a natural posture in front of the computer and maximum comfort for intermediate vision use. In addition to the optical design of lenses, it is essential to define an appropriate treatment for new light environments and for the spectral characteristics of the light emitted by screens. Visible light plays a crucial role in our everyday lives. It is essential, in particular, for the perception of colours, contrast and for visual acuity. Besides vision, certain frequencies of the visible light spectrum are even more important for our health. For example, blue-turquoise light, around 480 nm (465-495 nm) is known as “good blue” light because it is responsible for synchronizing our circadian rhythms (our biological clock) in charge of regulating our waking and sleep cycles, as well as our body temperature and mood , among other things. Chronic exposure to light also presents some risks for our visual health. Blue light is the highest energetic light to reach the retina, since ultraviolet radiation (UV), which is even higher in frequency, is blocked by the anterior ocular media. There is a rich literature on the harmful effects of blue light on the retina, the first articles dating back over forty years. But it was only recently that the precise spectrum of toxic action of this light on a cellular model of AMD was demonstrated. Joint research conducted by the Vision Institute (see inset) and Essilor International led to the identification of the most dangerous part of the blue light spectrum for retinal cells involved in the development of AMD . The light inducing the highest mortality rate in retinal cells corresponds to a narrow band of 40 nm centred on 435 nm5. These wavelengths correspond to the blue-violet light bordering on the turquoise-blue light that is essential to our health (Fig. 9). The research was conducted on retinal pigment epithelium (RPE) cells, the first cells to degenerate in AMD. These cells were photosensitized, to form a model of aging and AMD, and exposed to narrow 10-nm bands of illumination in the blue-green spectral range, between 390 nm and 520 nm, under physiological conditions of solar radiation on the retina (with a control band centred on red at 630 nm). 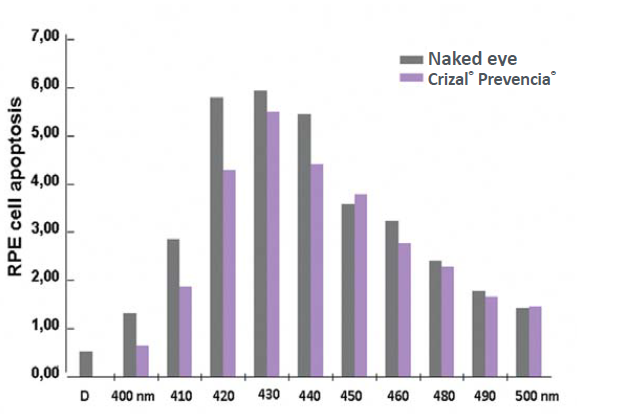 Photobiological studies demonstrated an average 25% reduction in cell death by apoptosis comparatively between Crizal® Prevencia® lenses and exposure without a filter over the spectral range [400 nm ; 450 nm]. Fig. 10 illustrates the comparative levels of apoptosis between the naked eye (grey) and a Crizal® Prevencia® lens for each blue light bandwidth. This level of protection over the long term would mitigate the risk related to harmful blue light, and therefore the onset of AMD. Fig. 10: Comparative results between a lens with Crizal® Prevencia® coating and the naked eye on cell death by apoptosis of photosensitized RPE cells, exposed for 18 hours in vitro to sunlight normalized for a 40-year-old human eye. Today, our eyes are confronted with potential new dangers, both at home and at work. Several independent studies conducted by health agencies are now taking an interest in risks related to new sources of artificial light, such as light emitting diodes (LEDs) , since the latter, particularly cool white LEDs, present an emission peak in the harmful blue-violet band (Fig. 11) and have a more elevated luminance/brightness than traditional sources. Yet, LEDs are now present in most modern lighting systems and in a large number of screens, especially computer, tablet and smartphone screens. Concerned about the amount of time we spend in front of screens, Essilor has made protection one of its priorities for its new range of lenses designed for a connected life. To protect our eyes, Crizal® Prevencia® coating, the product of a unique light filtering technology, was therefore integrated into the entire range. This technology selectively filters out harmful blue-violet light, emitted especially by screens, while allowing beneficial light (including blue-turquoise light necessary to the proper regulation of circadian rhythms) to pass through. This technology also provides the best protection against reflected light, smudges, scratches, dust and water for optimal vision and lasting transparency. The benefits of Eyezen™ lenses and mid-distance lenses combined with Crizal® Prevencia® coating have been confirmed by numerous tests. When evaluated under actual conditions of use, 89% of wearers reported that they experienced reduced glare and better contrast during screen use. In addition, in vitro tests have shown that blocking 20% of blue-violet light would reduce the rate of retinal cell (RPE) death by apoptosis by 25% . This should contribute to longer-term health benefits, and particularly to the prevention of premature aging of the eyes. For the prescriber, the Eyezen™ lens range stands out for its simplicity of implementation. We have made no changes to the prescriber’s usual practices. He or she conducts the eye exam to obtain the prescription in the usual manner. For Eyezen™ lenses, the only prescription required is for distance vision: the prescriber does not need to worry about selecting additional power. For Near, Mid and Room mid-distance lenses, the distance vision prescription and addition is required: the prescriber does not need to worry about selecting the design. As for the optician, Essilor can provide a “Screen Distance” measurement tool for in-store use so that the customer can also enjoy the benefits of a customized version of mid-distance lenses. All that the optician need do, when placing the order, is indicating the “Screen Distance” value obtained via this measurement tool in addition to the customer’s prescription. 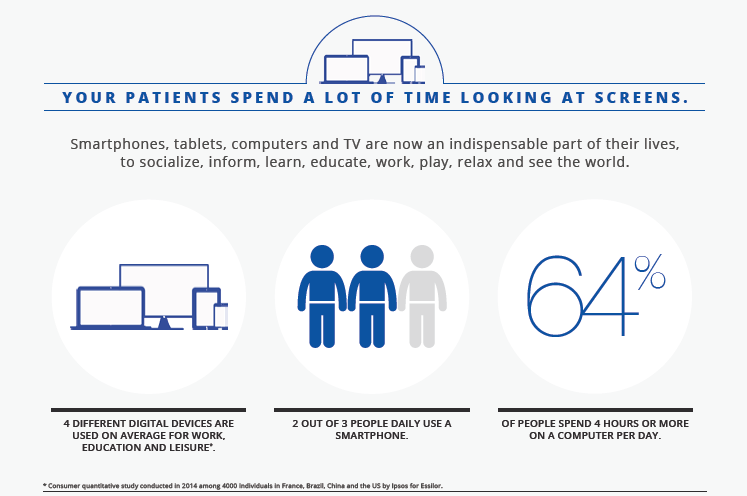 Fig.12 : "Your patients spend a lot of time looking at screens"
By continually placing consumers at the heart of its innovation process, Essilor closely studied how new digital devices and their use are impacting vision and posture, thus making it possible to identify and characterize new visual needs. This in-depth understanding of the users of digital devices led to a combination of two cutting-edge technologies of power distribution and light filtering. This patented technology alliance (several patent applications have been filed and are currently under consideration), the basis of both Eyezen™ lenses for ametropes and emmetropes and new mid-distance lenses Varilux® Digitime™ for presbyopes, brings a perfect solution for our new connected lifestyles. These new lenses underwent performance testing under actual conditions of use and prescription before they were placed on the market. This approach was adopted to confirm their benefits and measure wearer satisfaction. • Connected life has changed our light environment and visual and postural behaviours. • Essilor® internal and external research centers have achieved a detailed comprehension of these needs. • The new range of lenses for a connected life is the result of this research and was designed to respond to these new needs. • It is available in several products to specifically meet each user’s needs. • They are suitable for all users starting at age 20. • The range was tested and approved by wearers before it was placed on the market. 01. Ipsos, Digital devices users: behaviours and needs, May 2014. Quantitative consumer survey conducted in France, United States, China, Brazil, 4 000 respondents. 03. Anderson H. A., Hentz G., Glasser A., Stuebing K.K, Manny R.E., “Minus lens stimulated accommodative amplitude decreases sigmoidally with age: a study of objectively measured accommodative amplitude from age 3”. Investigative Ophthalmology and Visual Science, 2008, Vol. 49, N°7, pp 2919-2926. 04. Gronfier C., Lumière et fonctions non-visuelles : la bonne lumière bleue et la chronobiologie, Points de Vue, International Review of Ophthalmic Optics, N68, Spring 2013. 06. Martinsons Ch ., Les diodes électroluminescentes et le risque de la lumière bleue, Points de Vue, International Review of Ophthalmic Optics, N68, printemps 2013. 07. Barrau C., Kudla A., Lazuka-Nicoulaud E., Le Covec C., Crizal® Prevencia™: The first preventive non-tinted daily wear glasses to protect from UV and harmful blue light, Point de Vue, International Review of Ophthalmic Optics, N69, Fall 2013.